This is the last in this series of blogs relating the different coordinate systems available in astrology to real life. I know, this is abstract stuff folks, and I apologize, but there are a few of you out there who may find this useful. After this I will give you a rest and allow the Christmas holiday to kind of wash over us. Thanks for your patience! Margaret is making pies and the traditional pasty from the Upper Peninsula of Michigan is on the menu thanks to my daughter Anne. "As Above, So Below … but after another Manner"
The above familiar occult maxim might be the perfect description of what is involved in the various astrological coordinate systems and their transformations. There are two parts to the maxim. It is easy to communicate the first part, the concept of "wheels within wheels" (larger systems containing within them smaller systems like those Russian Matryoshka dolls), and this has resulted in the popular idea of the chakras or planes (planets) of our experience and self as an ascending hierarchy of levels, each inclusive of the preceding level. It is not quite that simple. What is not generally appreciated, but becomes increasingly clear when we examine the actual structure of the various cosmic systems, is not only the idea of larger systems embracing the small systems within them (levels), but that each larger system is also differently INCLINED to the preceding one. It should be understood that aside from the often-tedious mathematics involved in coordinate transformations, there is an accompanying philosophical or psychological adjustment to be made, a shift in viewpoint, a change in the approach or attitude to the subject. This empowerment merits our attention. So, there is not only an expansion in perspective when we move to a larger coordinate system, but also a reordering of our sense of direction. And it is this reordering that makes it so difficult for us to see beyond our present dimension and get a feel for what is absolutely our inevitable future. There exists what are termed "event horizons," beyond which we cannot understand how life can go on. An example of some event horizons: puberty, marriage, child birth, and death, to name a few of the classics. We cannot see beyond our present sphere into what our future might be like in these other dimensions because we cannot help but conceive of these events in terms of our present linear line of thought – extending it. However, to pass through these event horizons is not a simple linear extension of what came before. Instead, these changes involve a change in inclination or perspective – a shift. We do not watch our own change, for we are what is in fact in transition or change. We are what is changing. Try watching that. The idea presented here should be obvious: the crossing of an event horizon involves more than just some expansion or embracing of what we were before. It also involves, and this is the key, a reorientation of perspective on our part, call it a change of approach or attitude -- inclination. The new dimension or sphere we enter turns out (after our adjustment or change) to reveal our previous or past life in new light – from a different perspective. We see our old behavior and opinions differently in our new approach to life. It is very difficult to communicate the difference to one who has not yet had that experience. As mentioned, what has changed perhaps most is our INCLINATION. We do not want the same things we did want, or want them in a different manner. We are no longer inclined such that we feel the way we used to. We have a new angle on life, one we did not anticipate and in some cases our life may even revolve around a different center than before -- a wife or child, for instance, instead of a new car, etc. Many of these principles are graphically revealed through the study and exercise of the various astrological coordinate systems. We can map them. To repeat: it is the change in inclination in different coordinate systems that is hard to imagine, not just their inclusivity of one another. For instance, what may appear in one coordinate system as isolated and independent entities (or anomalies) that are apparently unconnected, when viewed through the lens or perspective of another system may define the basic shape of the system itself. How often in our lives does some singularity appear as if an "other" and foreign entity, but later, when we have experienced several of this type, they become just one of a class, representatives of a similar kind, although at first so unfamiliar. This same event becomes recognizable to us and loses its threatening quality when seen from another perspective. 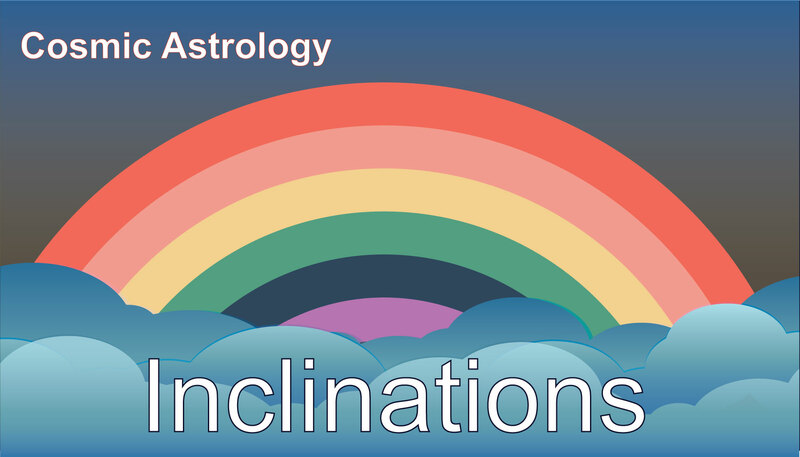 So "inclination" is key. I cannot apparently recommend strongly enough the exercise of these various ways or systems for understanding our universe to astrologers practicing today. Here is a list of some of the systems. When you study a coordinate system like the heliocentric coordinate system or the equatorial coordinate system, keep in mind that these systems are more than just numbers and math. They offer an insight into different areas of life and each can be charted or mapped astrologically and interpreted. 1. EARTH/MOON SYSTEM – Geocentric, of course, and includes the Zodiac (ecliptic) Coordinates, the Equatorial Coordinates of Right Ascension and Declination, which are inclines by about 23.4 degrees to the zodiac, and the Horizon Coordinates, which can be inclined at almost any angle to the others. Also the orbit of the Moon is inclined by 5.145-degrees to the zodiac. 3. LOCAL SYSTEM (Gould's Belt) -- This is a group of some 10.8 stars of which the sun is a member. The Local System, originally thought to be a minute galaxy embedded with the Milky Way, is considered to be an ellipsoid of 700x200 parsecs with the long axis parallel to the New galactic Longitudes 160 degrees/340 and located in Orion-Cygnus spiral arm. The centroid of the Local System is in Virgo at about 15-degrees Virgo 25' in the zodiac, with nodes to the Ecliptic at 10 degrees 22' of Sagittarius (North node) and Gemini. The system is inclined to the ecliptic by about 66-degrees. Note – positions are of the Epoch 1950.0. 4. LOCAL GALAXY -- The Milky Way. Estimated to contain 10 to the 11th stars, The galaxy is a disc-like structure with a diameter of some 30,000 parsecs, a central elllipsoidal nucleus of about 4000 parsecs, and an average disc thickness of several hundred parsecs. The nodes and center (about 27-degrees of Sagittarius) in relation to the ecliptic are given elsewhere. The sun is located some 10,000 from the galactic center. 5. LOCAL GROUP OF GALAXIES -- The local group includes about a score of member galaxies...the largest of which is the Andromeda galaxy (M-31), our galaxy, and M-31 revolve around a common center of mass roughly in the direction of 27-degress of the zodiac sign Aries. 6. LOCAL SUPERGALAXY -- Our galaxy is part of a vast flattened super system of galaxies some 40 megaparsecs in diameter, with the center (1-degrees of Libra) in the great Virgo Cluster some 12-16 megaparsecs from our sun.